Who's Ready For Second Summer? Around this time each year, there is a noticeable shift in the mainstream, and everyone from Walmart to the media to sports talk radio wants you to believe summer is over. Swimsuits and lawn chairs are on the deep discount aisle, magazine ads tout the new Fall fashions and the NFL is back in training camp. But you know what? Summer isn't over, not by a long shot. Sure, it's only a couple of weeks until the kids are back in school, but is that really even the end? When I was a kid, school didn't start back until summer was over; after Labor Day. My senior year in high school was the first year our school reported back before Labor Day, and it seemed like we got cheated out of those last couple of precious summer days. So, here we are, a full 38 days from Labor Day. Are we just going to give in and slog our way toward flannel shirts and pumpkin spice lattes? Not me, brother. My Second Summer starts today! Half the teams in the National League and just about every team in the American League is still in the running for the playoffs, so get out and support your local nine one last time. Nothing says summer like a warm evening with 30,000 of your closest friends, a cold beer and a hot dog. If you don't live in a major league city, check out your local minor league team. Chances are that with call ups and demotions the lineup is completely different than when you saw them back in May. I'll be going to the Charlotte Knights game on Friday, August 4th at 7:00. As we enter the Dog Days of Summer, what sounds better than a leisurely paddle down a cool river on a sundrenched afternoon. Be sure to bring a cooler and a fishing pole. I'll be joining the Anson County Chamber of Commerce on their August Paddle Day, August 5th starting at 10:00 PM. Most gardeners are in harvest mode this time of year, reaping the benefit of all the hard work they put in during the spring. But, it's not to late to plant something new for a late summer harvest. Green beans planted now will produce before the first frost in all but the coldest locales, lettuce will be ready to garnish that Labor Day cheeseburger, and even larger tomato plants (which are often deeply discounted this time of year) are likely to produce by the end of the season. Go to your garden center and see what they have left. You may have an opportunity to try some "unpopular" plant that is new to you. I saw some "Clemson Okra" today on sale at Walmart for a dollar a plant. Not a huge okra fan, but at that price, I'll give it a try. Many families plan their amusement park trips for early in the season, so as to avoid the excessive heat and not interfere with back-to-school activities, but why not give it a second spin, literally and figuratively. But, instead of going back to the same old spot, why not try something different. I know it's not an amusement park, per se, but the North Carolina Zoo in Asheboro is a great attraction the whole family will enjoy at a price far less than other similar attractions. 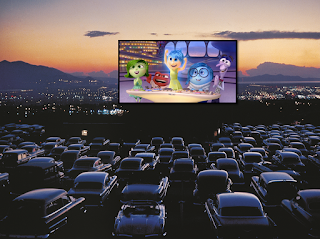 Yes, many of the big summer blockbusters have come and gone from the screens at the multiplex, but for those of us who live within reasonable driving distance of a drive-in (the closest one to me is the Sunset in Shelby, about an hour away) a few of those big summer films might still be playing as part of double features. This weekend, for instance, a twin-bill of The Emoji Movie and War for The Planet of the Apes is showing at the Sunset... and a carload is just $12. If you prefer a less open air movie experience, the Stephen King-based Dark Tower movie opens August 4th. Take the whole Ka-Tet. Any way you slice it, you've still got a solid month before Labor Day, so whether you're camping, running, entertaining friends outside, or taking part in any other type of outdoor activity, well... keep doing those things! And enjoy your Second Summer! Unless you've been living on an island in the far Pacific with Amelia Earhart for the past six months, you've probably happened across something called a fidget spinner. The first time I saw one was in a convenience store I frequent near the homestead. I made note of the trilobed plastic gadgets stacked at the register, but didn't really think too much about them, since that particular store has been known to sell everything from hair extensions to Carolina Panthers tiki dolls. A few days later, I saw something on the local news about therapeutic devices for dealing with anxiety and ADD. I didn't really make the connection until I saw a YouTube video touting the "healing powers" of what amounts to a rather boring toy. I'll say this for kids today, they know how to position a product. Back in my day, we never thought to promote our fad toys - knockers, whizzers, mood rings and spinners - as some sort of medical breakthrough. In fairness though, we did have stress relief gadgets which teachers gladly let us carry into class and fidget with to our hearts content. They were called "pens." The complex ones like the Paper Mate Power Point and the Bic 4-Color were the best. They could be disassembled then reassembled in various ways over and over again; great for both relieving tension and building manual dexterity. But even the simple Bic Cristal made an adequate fidget. Michael Perry recently posted an essay on one very specific way of fidgeting with a Cristal, but that was a little too "hoodlum"for my taste. I preferred to simply remove the nub and ink tube and the little plug from the top and see if I could reassmble the pen backwards. (You can, but it's not very satisfying) When I tired of that, I would take the plastic cap and bend the pocket clip back and forth in an attempt to get it to break. And that, my friends, is where the Bic Cristal excels as a fidget device. I'm not sure what kind of plastic that cap was made of, or whether the caps today are even made from the same stuff, but let me tell you this; separating that clip from the rest of the cap was a task back in the day. It took hours and hours of bending back and forth to even thin out the plastic, and a good week of intermittent bending to actually break one loose. I carried those clipless pens like a badge of honor. Alas, only I knew the time and effort that went into them. Pretty much everybody else just thought I picked them out of the trash. 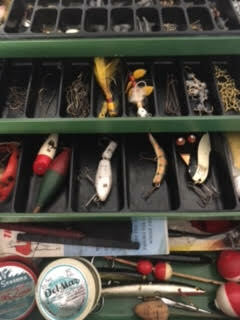 At any given time, there are a half-dozen or more vintage tackle boxes for sale on EBay. 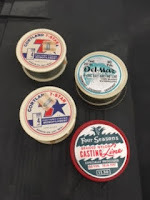 The majority of these come from estate sales or from families cleaning out basements and attics, and most of them are chock-full of tackle, left as-it-was the last time the owner went fishing. In some cases, that may have been years or even decades ago. 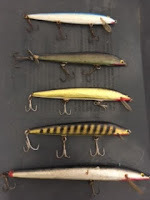 There's an entire subculture of tackle collectors who scour these listings looking for valuable vintage lures, and you can tell when they find one because the price of the auction jumps dramatically. That's all well and good, but for me the fun in these old tackle boxes isn't so much finding a rare popper I can add to my collection or sell for hundreds of dollars, it's getting a glimpse into one man's fishing life; unwrapping the mystery of how he ended up with the tackle he did, how he used it and what it meant to him. 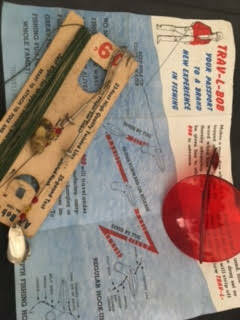 In some sense, the tackle box is like a snapshot of the fisherman. 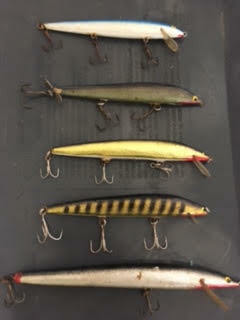 While there are certainly vintage plastic tackle boxes out there, I limit myself to metal exclusively. First of all, almost no metal tackle boxes were manufactured after the mid-70's, so any metal box you come across is going to be at least 40 years old and probably owned by an "old school" fisherman. Further, I like the classic look and heft of metal tackle boxes, although after purchasing a couple from EBay it becomes pretty apparent why plastic quickly took over as the material of choice. The very nature of fishing guaranteed that these boxes were subjected to wet conditions and any well-used box is going to be at some stage of rusting away, especially the bottom panel. I also try to limit my purchase price to $50 or less. 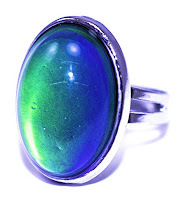 More than that and a collector has seen something he likes and I will find myself in a bidding war I am not going to win. When the box arrives in the mail, the first thing I do is take a few pictures of it in the undisturbed state. I would like to believe that everything is exactly the way the fisherman left it, but the sellers often rearrange things to better show the contents. Then I do a quick visual inventory and get a general impression of what sort of fisherman it belonged to and what sort of fishing he did. The box featured in these pictures was a little strange in that the owner had a lot of big, well-used stickbaits, but also had several unopened or barely used smaller Mepps. The type of line is also a clue both to the era and the type of fishing. This box contained both nylon braid, which rapidly fell from favor in the late-60's and mono-filament, but again the sizes were inconsistent. Four pound mono and 15-20 pound braided nylon. My guess is that he was probably a long-time bait caster going for bass, pike or other larger fish, but had recently started dabbling with a lighter spinning rod for panfish. A couple of "hidden gem" items from the box included a neat metal container of splitshot, what appears to be a hand-carved articulated crankbait and something called a Trav-L-Bob (Your passport to a new experience in fishing) which seems to be a sort of a mini planer board for bait casting. The box also contained the sort of junk that can be found in any decent tackle box; random knots of line with sinkers, kooks, swivels and bobbers still attached, a pair of old fashioned nail cutters that were so rusted I couldn't get them open and the ubiquitous (and practically useless) stamped metal fish scaler. If I add the value of all the items up, I would probably come somewhere close to the $40 (plus shipping, I think I must be the only vendor on EBay that ships for free) I paid for the tackle box at auction. So, now that I have the tackle cleaned and sorted will I just put it on a shelf and admire it? Of course not. That's not what the fisherman who put this together would have wanted. He would have wanted his stuff to have a second life and so it will... on my next fishing trip. If you've ever wondered what it would be like if C.J. Box novels were set in Maine, Paul Doiron is an author you need to check out. As much as I love Box's writing, there are aspects of his books --, the sweeping Western vistas, the ranch mentality -- that I sometimes have difficulty relating to. While I am certainly no more a native of Maine than I am of Wyoming, the ecosystems described in Doiron's book seem a lot more familiar to me. 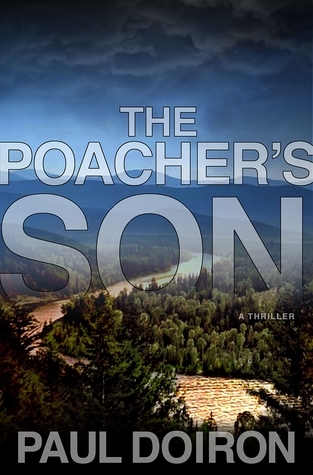 The Poacher's Son is the first in a series of novels featuring Maine game warden Mike Bowditch. As the story begins, Mike is a 20-something warden just barely removed from training and working in a small coastal town. He lives alone, having recently split with his girlfriend over his choice of occupation and her desire to live a more "urban" existence. Late one summer night, he gets a phone message from his estranged father. Events unfold and he finds himself defending his fugitive dad from murder charges, perhaps at the expense of his fledgling career. We learn that Mike's relationship with his father is complex and fraught with ugliness. Doiron paints an accurate and disturbing picture of a basically good person coming to grips with the way he was raised and the limitations of his father's love and acceptance. Interjected into the story is a father figure, retired warden Charley Stevens, who is everything that Mike wishes his father had been. It's a touching portrayal that may be just a bit heavy-handed at times but ultimately works. Charley helps Mike get to the bottom of the murders, and in doing so, put his conflicted feelings about his father behind him. As a mystery, the story is okay, especially for a first-time author trying to establish characters and setting while working through the narrative. I'll give Doiron points for not getting too cute with the big reveal or coming up with some out-of-left-field ending. Having said that, there was a point at which I thought the story might be heading in a different direction and I think that might have been an interesting path to meander a little farther down. If, like me, you are a fan of Box, James W. Hall's Thorn series or the even quirkier Keith McCafferty fly fishing mysteries, you will definitely enjoy this book. I'm giving it a B+ and am looking forward to checking out the other eight titles in the series.